THE UNIVERSITY’S enterprise leaders are at the forefront of creating jobs through innovation for Europe’s regions. Members of MMU’s Centre for Enterprise (CfE) joined colleagues from across the European Union to swap ideas on how to generate tourism. Academics and leaders from the CfE passed on their sought-after knowledge to help boost city regions - from Romania to Norway - as part of the ‘Smart Europe’ project. The Centre’s experts were joined by colleagues from 13 regions from EU member states made up of universities, city councils, science parks and regional development agencies. 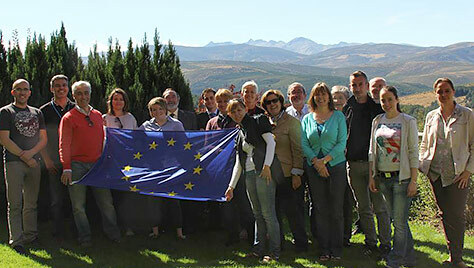 The five-day visit was hosted by the Diputación de Ávila, in Spain, to help create a flow of ideas via peer review on how to boost employment through tourism. Russell Yates, enterprise development fellow at MMU, said: “The idea is to use the different skills and cultural perspectives to get an outsider’s opinion on each city region, in this case Ávila. Agustin Gonzalez, president of Ávila, encouraged delegates ‘take advantage of the province’ and to ‘take ideas back to their countries’ to put into practice. The goal is to get the partners to ‘exchange impressions’ on tourism, which could not only serve as recommendations in Ávila, but also strengthen the tourism sector in each of the participating countries. The Smart Europe project aims to help the different regions to ‘find assets of innovation to incorporate these strengths with the creation of employment’. Now, the partners will create a report compiling all their recommendations for the region. It will draw on strategies that have proved effective in their own city regions to help Ávila accelerate the growth and creation of innovation-based jobs. Smart Europe has now been running for two years and the Ávila peer review was one of the last to be completed. The project will now move into the next phase, where partners are tasked with implementing their recommendations.